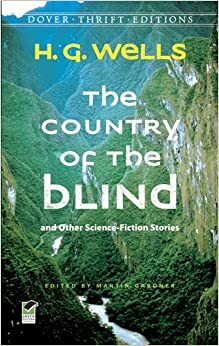 "The Country of the Blind" is one of H.G. Wells' short stories, probably his most famous. I read it in the early 80s and thought I remembered what the story was about. But I re-read it recently and realized I was wrong. The story is about a community, isolated in a valley, where a disease blinds all the babies. Everyone in the community is blind, and they've adapted their town life accordingly. A sighted man accidentally comes upon the community and believes that, "in the country of the blind, the one-eyed man is king" (which inspired another short story in Asimov's magazine, about a Babbage machine and a time travel paradox, but damn if I can remember who wrote it or what it was called....). He's soon proved wrong and leaves the valley to perish because he can see a rock slide about to happen and no one believes that sight is actually a thing. I remembered the story as an illustration of how a disability is only a disability because of how society is structured. But H.G. had a different message in mind. I appreciate where he was coming from (more of a none so blind as those who will not see kind of place), but still. I was disappointed. One day I will write the story I remember. I will sit down and imagine what a town might be like where everyone is blind, and how they might do their science, and prove or disprove things like how high the sky is. And a sighted visitor shall come, and believe that he can be king. And he shall be the disabled one in, the Country of the Blind. wtf. that's horrible. like they couldn't hear the frikin landslide coming? !